Series LF3L and LF53L are used for protection against excessive pressure on domestic storage tanks or tankless water heaters. Similar in construction to Watts Model LF10L, the Model LF3L has no temperature relieving element. Model LF53L has the same basic design as Model LF3L except it is furnished in 1/2 in. (15mm) size and does not comply with ASME requirements. Pressure range is 75-150psi (5.2-10.3 bar). Series LF3L and LF53L come in standard settings of 75, 100, 125 and 150psi (5.2, 6.9, 8.6 and 10.3 bar). 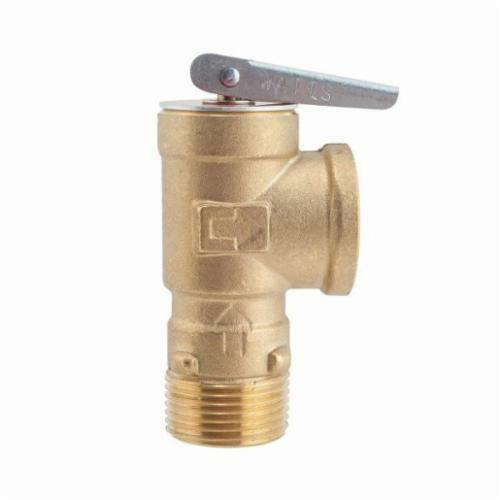 These Pressure Relief Valves are popularly used in conjunction with the Model LF210 gas shutoff valve on gas water heaters to shut off gas to heater if water heater temperature exceeds 210 deg F (99 deg C). The LF3L and LF53L features Lead Free* construction to comply with Lead Free* installation requirements.